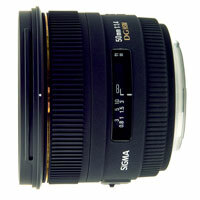 I have the Sigma 30 mm f/1.4 lens, although that one is for APS-C size sensors. I love that lens to bits. I was looking for a 50 mm lens, just to get a mild telephoto for portraits on my 350D. It looks like this may be the one. Let us know how the sharpness turns out in practice.